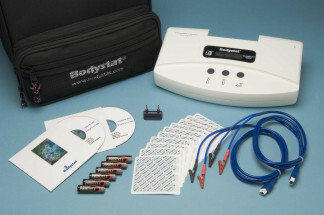 The Bodystat(R) QuadScan 4000 device offers a quick, easy, economical and non-invasive alternative to other methods of fluid assessment and Body Composition analysis, e.g. radioisotope dilution, underwater weighing. The principle of measuring the flow of current through the body (impedance) is dependent on the frequency applied. At low frequencies, the current cannot bridge the cellular membrane and will pass predominantly through the extra-cellular space. At higher frequencies penetration of the cell membrane occurs and the current is conducted by both the extra-cellular water (ECW) and intra-cellular water (ICW). By measuring the impedance at 5 kHz and 200 kHz and by applying predictive equations, it is possible to estimate both ECW and TBW (Total Body Water) respectively and by deduction, ICW. ECW can be related to Extra-Cellular Mass and ICW to Body Cell Mass. By measuring the impedance at 50 kHz and applying the unique Bodystat equation Body Fat, Lean Mass and Dry Lean Mass can be assessed. The QuadScan 4000 contains separate Body Composition equations for Children 6 years and over and Adults. In addition the QuadScan 4000 measures at 100 kHz. Total body weight, height, age and gender are required by the predictive equations used in the hardware unit to display the results on the LCD screen. Where it is impractical to determine weight, as in the case of certain hospitalised patients, alternative equations can be applied in the QuadScan 4000 program to calculate ICW, ECW and TBW. Whole Body analysis, rather than partial body analysis of arms or legs only, is measured for greater accuracy. In addition, alternative equations provide for the proximal placement of electrodes on sternum and knee to potentially monitor more sensitively the changes in fluid levels in the trunk area. The strategic placement of electrodes on the chest area could provide for the monitoring of change in impedance values (hence fluid shifts) in the left and right lung individually. The Body Composition Data is instantly downloaded directly from the QuadScan 4000 using Bluetooth technology. This saves time and eliminates the risk of error inherent in re-keying subject data. Body Composition Analysis in a 2-page summary report. Trend Report, enables a user to track lean/fat ratios, fluid levels and impedance values over a period of time. The user can also track changes in Blood Pressure, Cholesterol, Waist to Hip, Heart Rate and Lung Function. Weight & Activity Manager, allows a user to develop a series of exercises in order to calculate the amount of kilocalories these will burn This adjustment may then be incorporated into a user's own diet program. The number of weeks to achieve goal weight is automatically determined. Cardiac Risk Analysis, assessment of health status relating to lifestyle. Factors include exercise levels, smoking, blood pressure, family history, etc. The screen immediately displays the effects of potential lifestyle changes e.g. if a subject smokes 20 cigarettes a day and they agree to reduce their smoking to 5 cigarettes a day the impact on their Cardiac Risk can be seen immediately on the screen. Alternative Equations, these are available for competitive athletes, children 6 years and over and geriatrics and may be selected as required by the user to determine % fat and lean muscle levels. Alternative metabolic formulae are also included and the user has the option to select their own % fat ranges. TBW, ECW and ICW Trend Reports, these reports enable the user to track the changes in a patient's hydration status and body cell mass. "The use of Bodystat Quadscan has changed the paradigm of so called weight loss and instead focused our attention on the main core issue of redistributing fat and muscle by analyzing the body composition. My patients have a completely new outlook in terms of the concept of weight and wellness. Bodystat Quadscan is such an easy tool to measure body composition and provide the patients with regular objective measurements that they can see and analyze over a period of time. My patients who range from obese to athletes have benefited tremendously from the use of this machine. I cannot imagine doing what I do without the use of this tool". Click here for "More Bodyfat Analyzers"